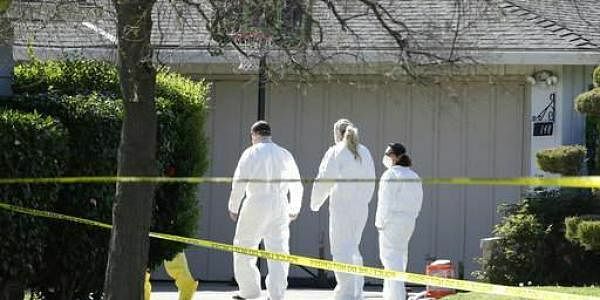 The four victims were discovered when police broke into the Sacramento home after a relative reported that something might be wrong. CALIFORNIA: Police found four people, including two children, dead on Thursday in a California home and a suspect was in custody, officials said. Police did not immediately identify the victims or provide their genders or ages. Kelly Fong Rivas, deputy chief of staff for Sacramento Mayor Darrell Steinberg, said police told officials that two of the victims were children but did not provide other details. Steinberg called the crime horrifying and extremely tragic in a statement praising police for quickly making an arrest. The unidentified suspect was likely known by the victims and was being held in San Francisco, Sacramento police Sgt. Bryce Heinlein said. "Preliminarily this does not appear to be a random act," Heinlein said. Police said they had not yet determined a motive. The single-story beige home with sculpted shrubbery has a basketball hoop in a driveway that police blocked off with yellow crime scene tape. It's located in a tree-lined residential neighborhood of neatly maintained homes near a church. It was unclear when the victims were killed, Heinlein said. Police also weren't saying how they were killed. There were no reports of shots fired or other problems until the relative called police to report that he was concerned, Heinlein said. A few neighbors looked on curiously as homicide detectives and crime scene investigators made their way in and out of the home south of the state Capitol. Don Sherrill, whose home shares a back fence with the victims' house, said he and his wife, Joanne Sherrill, often heard children playing in the backyard or using an inflatable pool. "The young kids really enjoyed the backyard and swimming in the summer time," Joanne Sherrill told The Sacramento Bee.